The Missouri Botanical Garden in St. Louis recently opened an exhibition of nine TREEmendous Extreme Treehouses, seven of which won a juried competition for being imaginative, non-traditional, ground level treehouse structures. The treehouses were built by designers in and around the St. Louis area and many of the innovative structures include sustainable design elements and encourage kids to explore and play in nature. 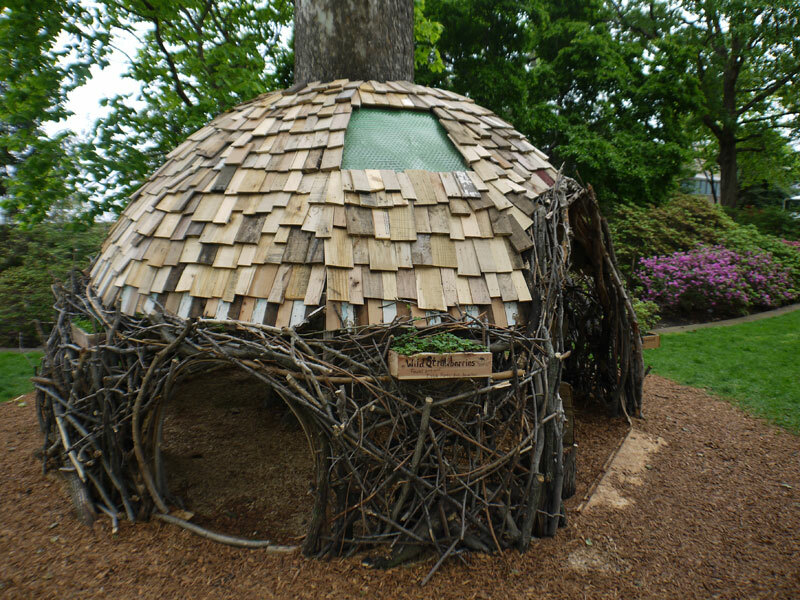 For example, the Nomad Nest above, designed by Kansas City Institute of Art students, is made from salvaged fallen branches and saplings, and it includes a kids' crawl space and planters containing wild edibles. Read on to see the other truly amazing TREEmendous Extreme Treehouses. “Inside the Tree House” above, is another highlight of the Missouri Botanical Garden’s TREEmendous Extreme Treehouses exhibit running through August 21 as part of the garden’s yearlong celebration of the U.N. International Year of Forests. The treehouse was designed by a team including Ann Floresk Architect, Villinger Construction Company, Teiber Construction Company, and Thies Farm and Greenhouses. The hexagon-shaped house is made from re-purposed wood and incorporates several sustainable design features — solar power, a recycled rain water system and green roof technology. Plus, root tunnels, leaf shutters and models of forest inhabitants educate kid visitors. Other treehouses include: the AMAZEing Rings, designed by Washington University students, which is a maze-like wood and fabric structure made to look like a tree’s ring structure; Treehenge designed by Burns & McDonnell a Kansas City engineering and architecture firm, a Stonehenge-like structure built from bamboo and reused utility poles; and A “Living” Room in a Garden, designed by St. Louis architecture and design firm Christner Inc, made from salvaged Christmas trees with a play area featuring oversized logs that children can use to build and create. For another perspective of the treehouse, check out the view of the sycamore tree from inside the Nomad Nest where you'll find a table and chairs. The students came up with the design for the Nomad Nest as a way to demonstrate how to sustainably use urban flora every day. "Inside the Tree House" is another highlight of the Missouri Botanical Garden's TREEmendous Extreme Treehouses exhibit running through August 21 as part of the garden's yearlong celebration of the U.N. International Year of Forests. The treehouse was designed by a team including Ann Floresk Architect, Villinger Construction Company, Teiber Construction Company, and Thies Farm and Greenhouses. The hexagon-shaped house is made from re-purposed wood and incorporates several sustainable design features -- solar power, a recycled rain water system and green roof technology. Plus, root tunnels, leaf shutters and models of forest inhabitants educate kid visitors. AMAZEing Rings, designed by Washington University students, is a maze-like wood and fabric structure made to look like a tree's ring structure. You can walk through this treehouse on a two-way traffic path that's lined with educational panels explaining the functions of different parts of the ginkgo tree its located below. A "Living" Room in a Garden, designed by St. Louis architecture and design firm Christner Inc, is fashioned as a typical living room, but in this treehouse the focus of attention is on a tree instead of a fireplace. The treehouse is made from salvaged Christmas trees, which have been recycled into both fabric and construction material. Fir, pine needles, and small branches were used to create a rug-like seating area, and there is also a play area featuring oversized logs that children can use to build and create. Treehenge designed by Burns & McDonnell a Kansas City engineering and architecture firm, a Stonehenge-like structure built from bamboo and reused utility poles. Within the tree space, visitors can find pictures, maps and GPS coordinates to help them find 30 marked trees throughout the St. Louis region, which is part of the TREEmendous Great St. Louis Tree Hunt. Designed by Manzo Architects, A Treed Place of Play, was created to mimic impromptu hideouts that kids discover and explore outside. 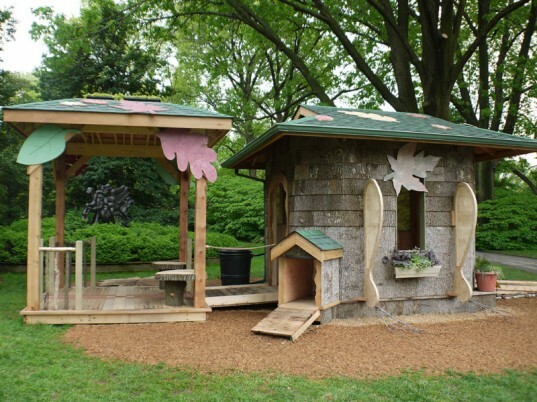 The treehouse features eye-slits, hidey-holes, and a spot to relax and check out the tulip tree's canopy and sky above. The Sweet Gum Treehouse was designed by Roost Design Studio to act as a "Gateway to the Garden" with a structural pathway so garden visitors can view the cedar trees. Built below a sycamore tree, Reflections Tree House, is inspired by the aerial and buttress roots cast by large trees. Students from Ranken Technical College designed it to look as if this treehouse were part of the tree itself. Another treehouse commissioned by Christner Inc in partnership with Engraphix Inc., the House+Tree=Phi is an abstract look at how humans connect with trees, nature, and the universe using the classical principles of Phi and whimsical treehouse construction.